Download "Renault New Vehicle Warranty Terms and Conditions Coverage of the Warranty"
1 Renault New Vehicle Warranty Terms and Conditions Coverage of the Warranty Warranty in years 1 to 3 is provided by Renault Group the Warranty extension in Years 4 and 5 is provided by Renault Ireland and the terms and conditions are stated below. The Renault New Vehicle Warranty is in addition to and does not in any way affect the customer s rights under the Sale of Goods and Supply of Services Act. 1980, or any other statutory and common law rights which the customer may have against the seller or manufacturer arising from the purchase of the vehicle. The Renault New Vehicle Warranty covers the cost of repair or replacement of defective parts to repair a material, assembly or manufacturing defect acknowledged by the manufacturer. It also covers consequential damage to the vehicle resulting from the principal defect. The decision whether to repair or replace a defective part shall be at the sole discretion of Renault. Normal wear and tear on certain parts that are subject to wear and tear is not covered by the warranty. Renault Paintwork Warranty/Anticorrosion Warranty covers the cost of repair or replacement of components with inherent paintwork defects acknowledged by the manufacturer due to any material, manufacturing or application defect. It also covers repair or replacement of bodywork components with perforated paneling. Applicability: The customer will benefit from free repair (parts and labour) of any defect concerning materials or assembly noted on the vehicle at the customer s own request. All parts replaced under the Renault New Vehicle Warranty legally become the property of Renault. All operations, parts and labour, carried out under the Renault new Vehicle Warranty are guaranteed until the expiration of the vehicle s contractual warranty. Geographical Coverage: The warranty applies to any new Renault vehicle sold in the Republic of Ireland and is applicable as long as the vehicle is driven in and remains registered in one of the following countries: Andorra, Austria, Belgium, Bulgaria, Bosnia-Herzegovina, Croatia, Cyprus, Czech Republic, Denmark, Estonia, Finland, France, Germany, Greece, Hungary, Iceland, Ireland, Italy, Latvia, Liechtenstein, Lithuania, Luxembourg, Macedonia, Malta, Monaco, Norway, Poland, Portugal, Romania, San Marino, Serbia- Montenegro, Slovakia, Slovenia, Spain, Sweden, Switzerland, The Netherlands and the United Kingdom. Transfer of Ownership: Transferring ownership of the vehicle does not alter the application conditions of the Renault New Vehicle Warranty. 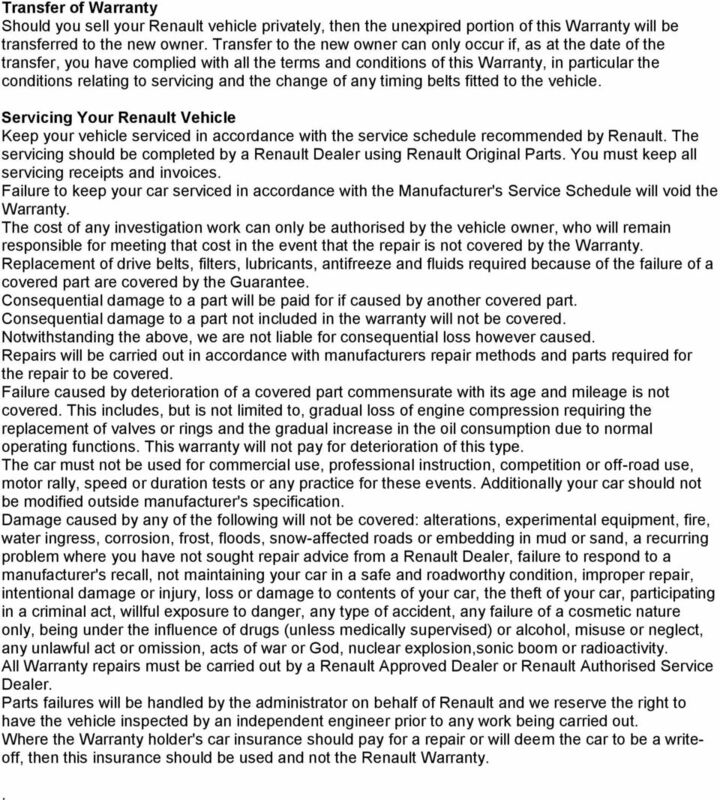 Terms of the Warranty The Renault New Vehicle Warranty cover begins on the date of delivery of the vehicle to the customer. The date of delivery is specified on the Warranty and Service Sheet provided to you by your Renault Dealer during the new vehicle handover, and the cover is for a period of 36 months from that date. SPECIAL NOTE: Parts subject to wear and tear may have reduced cover under the New Vehicle Warranty. Please see below section entitled Reduced Cover for Parts subject to Wear and Tear for details. The Renault Paintwork/Anticorrosion Warranty cover begins on the date of delivery of the vehicle to the customer, and the cover is for the period specified on the Warranty and Service Sheet provided to you by your Renault Dealer during the new vehicle handover. Mileage Limitation: The Renault New Vehicle Warranty provides cover with unlimited mileage in the first 24 months. Mileage is limited in the period from 24 months to 36 months. During the period from 24 months to 36 months if the mileage of the vehicle has exceeded the mileage limitation specified on the Warranty and Service Sheet the Renault New Vehicle Warranty shall be deemed to have expired. 2 Conditions of the Warranty General Conditions: All repair work carried out under the warranty must be carried out by a Renault Dealer or a Renault Authorised Repair Centre. To benefit from the warranty the customer must: Check that the Date of Delivery and VIN shown on the Warranty and Service Sheet provided to you by your Renault Dealer during the new vehicle handover are correct. Notify a member of the Renault dealer network of any defect covered by the warranty and authorise the dealer to carry out the repair by signing the dealership Repair Order. 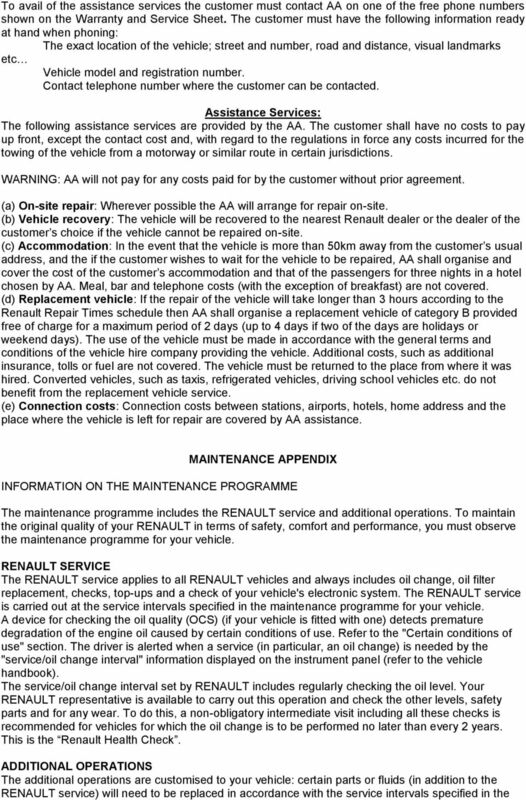 Present the maintenance record duly filled in, justifying entitlement to the warranty and showing that the maintenance operations recommended by Renault have been carried out. Maintenance: The vehicle must be regularly serviced according to the Maintenance Program shown on the Warranty and Service Sheet provided to you by your Renault Dealer during the new vehicle handover, whilst adhering to approved Renault standards as described in the Owner s Handbook in order not to risk invalidating the Renault New Vehicle Warranty should an incident be due to the lack of or quality standard of servicing. You can find contact details for any dealer in the Renault network in Ireland on our website: Application of the Renault Anticorrosion Warranty is subject to strict adherence to the manufacturer s recommendations and to anticorrosion tests on the bodywork and sub frame. These tests must be conducted as scheduled on the Warranty and Service Sheet provided to you by your Renault Dealer during the new vehicle handover. The warranty does not in any way cover any of the costs of servicing or maintenance of the vehicle. 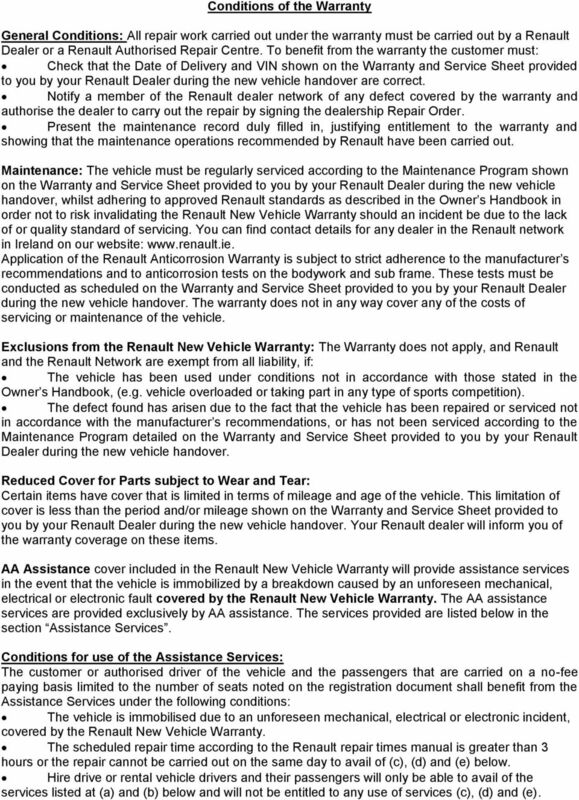 Exclusions from the Renault New Vehicle Warranty: The Warranty does not apply, and Renault and the Renault Network are exempt from all liability, if: The vehicle has been used under conditions not in accordance with those stated in the Owner s Handbook, (e.g. vehicle overloaded or taking part in any type of sports competition). The defect found has arisen due to the fact that the vehicle has been repaired or serviced not in accordance with the manufacturer s recommendations, or has not been serviced according to the Maintenance Program detailed on the Warranty and Service Sheet provided to you by your Renault Dealer during the new vehicle handover. Reduced Cover for Parts subject to Wear and Tear: Certain items have cover that is limited in terms of mileage and age of the vehicle. This limitation of cover is less than the period and/or mileage shown on the Warranty and Service Sheet provided to you by your Renault Dealer during the new vehicle handover. Your Renault dealer will inform you of the warranty coverage on these items. AA Assistance cover included in the Renault New Vehicle Warranty will provide assistance services in the event that the vehicle is immobilized by a breakdown caused by an unforeseen mechanical, electrical or electronic fault covered by the Renault New Vehicle Warranty. The AA assistance services are provided exclusively by AA assistance. The services provided are listed below in the section Assistance Services. Conditions for use of the Assistance Services: The customer or authorised driver of the vehicle and the passengers that are carried on a no-fee paying basis limited to the number of seats noted on the registration document shall benefit from the Assistance Services under the following conditions: The vehicle is immobilised due to an unforeseen mechanical, electrical or electronic incident, covered by the Renault New Vehicle Warranty. The scheduled repair time according to the Renault repair times manual is greater than 3 hours or the repair cannot be carried out on the same day to avail of (c), (d) and (e) below. Hire drive or rental vehicle drivers and their passengers will only be able to avail of the services listed at (a) and (b) below and will not be entitled to any use of services (c), (d) and (e). 5 Extension to the manufacturer 3 Year Warranty. Extension to 5 Yrs with Unlimited Mileage. 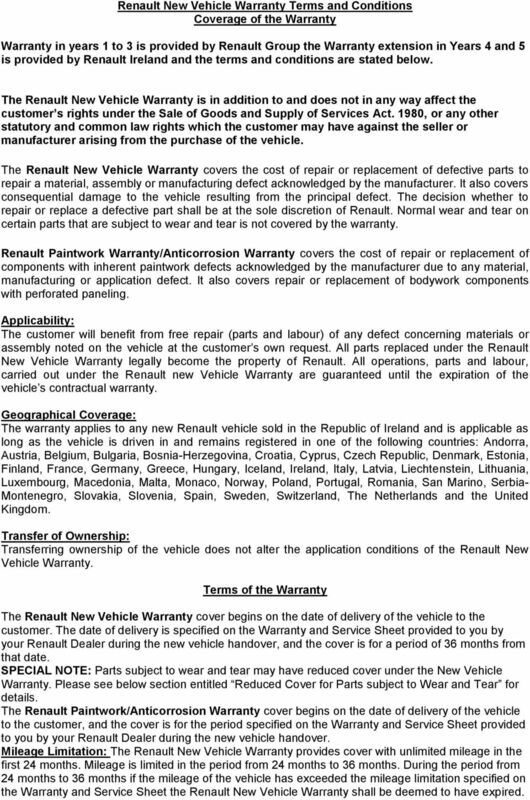 EXTENDED WARRANTY FOR YOUR NEW VEHICLE The Warranty extension in Years 4 and 5 is provided by Renault Ireland and the terms and conditions are stated below. We are sure you will understand that normal wear & tear and damage caused by overstressing, incorrect handling or inadmissible modifications are not covered by this Warranty. Please note the maximum amount payable under the Warranty during the period of Warranty shall be up to the purchase price of the vehicle as stated on the Warranty schedule. All replacement parts and labour will be paid including exhaust systems (incl. the catalytic converter) but with the following exceptions: 1. Any mechanical failure in respect of which you are entitled to compensation from any other company or have any other rights. 2. Any mechanical failure the subject of a product recall. 3. Any mechanical failure resulting from normal wear and tear. 4. Rectification of rattles, squeaks, adjustments and water entry. 5. Any item fitted to your vehicle which is not an original Renault approved option or accessory, or any damage caused by such item or the fitting of such item. 6. Any damage to the vehicle (including the windscreen) attributable to impact or road traffic accident or any act or omission by any person which is wilful, unlawful or negligent. 7. Any damages occurring, or repairs required, as a result of the continued operation of the vehicle or covered component after a mechanical failure or other defect (including loss of lubricants or coolants), has occurred (notwithstanding the foregoing, should any of the warning indicators display the need for attention and be ignored, any resultant damage will not be covered by that warranty). 8. Any mechanical failure of a covered component caused (whether in whole or part) by a noncovered component. 9. Any mechanical failure attributable to abuse, misuse, neglect, negligence, improper servicing or repair, the use in the vehicle of fuel which is of poor quality, contaminated or the wrong grade or specification for the vehicle, and the failure to maintain recommended levels of any fluids or lubricants. 10. The replacement of consumable including (but are not limited to) spark plugs and leads, glow plugs, belts, filters, hoses, brake and clutch linings, brake pads, disc rotors and or disc and drum and machining, batteries and bulbs, LED s/ LED units, oil seals, gaskets, external linkages, clutch friction plates, re-charging air conditioners, fuel, lubricants, wiper blades and coolants. 11. Any mechanical failure attributable to repairs not carried out in accordance with the manufacturers repair methods with parts to the manufacturer s specification. 12. Damage to, or failure of wheels, tyres, paintwork, bodywork, chrome, seals, panels and all glass items, decorative or trim components, (including but not limited to seat covers, door trips, soft top/ convertible roof trim, covers, carpets, edge protectors), windscreen moulds, weather strips and seals, cup holders, ashtrays, telephone handset, software and battery. 13. Any maintenance, adjustment, upgrade, modification, and or re-programming required. 14. The cleaning of any component including the removal of any algae, carbon or sludge. 16. Any mechanical failure caused by corrosion, electrolysis or rust, any tappings, screws, and/or fixing and fastening devices. 16. Any mechanical failure attributable to any modification made to your vehicle. Should your car develop a fault, please contact your local Renault dealer or call Please refer to your Warranty Schedule for the Warranty number and the details of the vehicle to which this Warranty applies. Duration of Cover The cover duration is for 24 months after the expiry of the Renault manufacturer s warranty and for unlimited mileage. You may need to review this cover periodically to ensure it remains adequate for your needs. Please refer to your Warranty schedule which will show the duration of cover applicable. 6 Transfer of Warranty Should you sell your Renault vehicle privately, then the unexpired portion of this Warranty will be transferred to the new owner. Transfer to the new owner can only occur if, as at the date of the transfer, you have complied with all the terms and conditions of this Warranty, in particular the conditions relating to servicing and the change of any timing belts fitted to the vehicle. Servicing Your Renault Vehicle Keep your vehicle serviced in accordance with the service schedule recommended by Renault. The servicing should be completed by a Renault Dealer using Renault Original Parts. You must keep all servicing receipts and invoices. Failure to keep your car serviced in accordance with the Manufacturer's Service Schedule will void the Warranty. The cost of any investigation work can only be authorised by the vehicle owner, who will remain responsible for meeting that cost in the event that the repair is not covered by the Warranty. Replacement of drive belts, filters, lubricants, antifreeze and fluids required because of the failure of a covered part are covered by the Guarantee. Consequential damage to a part will be paid for if caused by another covered part. 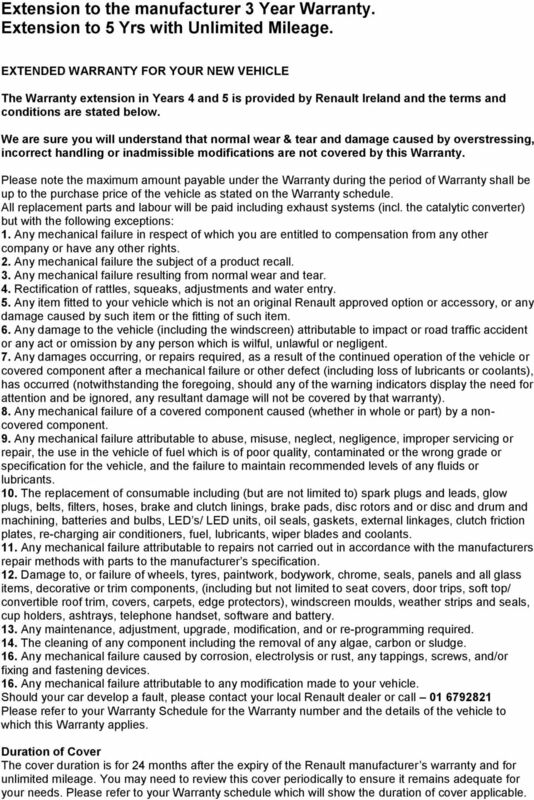 Consequential damage to a part not included in the warranty will not be covered. Notwithstanding the above, we are not liable for consequential loss however caused. Repairs will be carried out in accordance with manufacturers repair methods and parts required for the repair to be covered. Failure caused by deterioration of a covered part commensurate with its age and mileage is not covered. This includes, but is not limited to, gradual loss of engine compression requiring the replacement of valves or rings and the gradual increase in the oil consumption due to normal operating functions. This warranty will not pay for deterioration of this type. The car must not be used for commercial use, professional instruction, competition or off-road use, motor rally, speed or duration tests or any practice for these events. Additionally your car should not be modified outside manufacturer's specification. Damage caused by any of the following will not be covered: alterations, experimental equipment, fire, water ingress, corrosion, frost, floods, snow-affected roads or embedding in mud or sand, a recurring problem where you have not sought repair advice from a Renault Dealer, failure to respond to a manufacturer's recall, not maintaining your car in a safe and roadworthy condition, improper repair, intentional damage or injury, loss or damage to contents of your car, the theft of your car, participating in a criminal act, willful exposure to danger, any type of accident, any failure of a cosmetic nature only, being under the influence of drugs (unless medically supervised) or alcohol, misuse or neglect, any unlawful act or omission, acts of war or God, nuclear explosion,sonic boom or radioactivity. All Warranty repairs must be carried out by a Renault Approved Dealer or Renault Authorised Service Dealer. Parts failures will be handled by the administrator on behalf of Renault and we reserve the right to have the vehicle inspected by an independent engineer prior to any work being carried out. Where the Warranty holder's car insurance should pay for a repair or will deem the car to be a writeoff, then this insurance should be used and not the Renault Warranty..
WHAT ARE YOUR EU RIGHTS WHEN TRAVELLING ACROSS THE EU?